1. Cook the couscous according to pack instructions. 2. Toss the chick peas in a bowl with the lemon juice, ras el hanout and cumin seeds. Add the couscous, season and set aside. 3. Heat a griddle pan or barbecue until hot, cut the aubergine into wedges, brush with the groundnut oil and griddle for 4 minutes until charred and tender. 4. 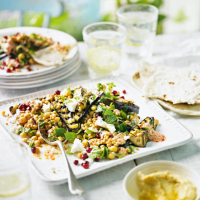 Toss the herbs in with the couscous, gently mix in the aubergine and pile onto a plate. Crumble over the feta. 5. Mix the harissa with the yogurt, drizzle over the salad, scatter with the pomegranate seeds and a drizzle of tahini sauce. Serve with flat breads and houmous.